We are glad you stopped by. This is the place to get more act!vated. Here is where you can find out when and where the next show is. Listen to an Activated Stories podcast with your kids. And be sure to share your photos and thoughts about the performance or podcast on Facebook. We'd be tickled to hear from you! 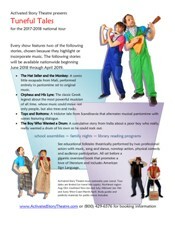 You are invited to free public shows sponsored by public libraries and other venues. Our study guides are loaded with Act!vated Act!vities to help you and your children dive deeper into the stories. Dive into the collection of stories adapted from the stage productions. Read them aloud with your children and let them explore the interactive pages. 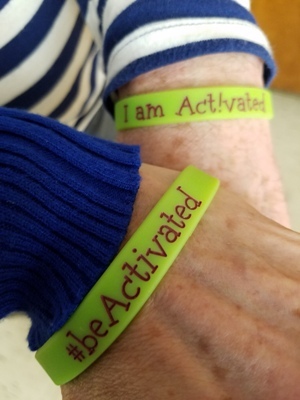 What is #beActivated? It is using your imagination. Playing. Being physically fit so you can do amazing things. Inspiring others to dream big. When we put on a show we go all out. We live that philosophy off stage too. We hope you are inspired to exercise your imagination, do physical comedy, read stories. Do cartwheels, walk on a slackline, parachute out of an airplane. Live life to the fullest! Go ahead use the hashtag #beActivated when posting photos of yourself trying new things online. We get a kick out of connecting with our audience. Feel free to follow us on any or all of the social media outlets. We strive to provide fresh content on each. Stay in the loop on Facebook, check our upcoming events to RSVP and sign up kids who want to be in the show. Let your child's school know that we do educational shows for school assemblies, after school programs and family nights. Tweet! Let your twitter followers know what you thought about the stories. Point them to something you like on our web site. Do you write a blog that is read by other parents? Coming up with new content for your readers can be a challenge. Or perhaps you can offer to write a guest post on for a blog that you love. Check the Media Center for background information or grab a Press Release for one of our upcoming public performances to share with your tribe. Or Email us if you are looking for guest bloggers. Tell your local library that they can get Act!vated. Share our web address with your favorite children's librarian. Read a folktale you like? Share it on Pinterest. Rate and review Act!vated Stories podcast on iTunes or whatever app you use to listent to podcasts with. It only takes a second and helps others find the free stories to share with their kids. Get your Act!vated CDs on CD Baby. Your reviews are welcome and greatly appreciated there too. We are a small operation with big goals and dreams of making high quality theatre accessible to all. If you are passionate about inspiring children to read and explore theatre arts you can help. Your donations will help us reach more underprivileged children. All donations are tax deductable and we guarantee that 100% goes towards bringing theatre to children in underserved communities. Please consider giving what you can. Anything helps.